Marble Canyon in Kootenay National Park, a high altitude campground with beautiful mountain vistas. Excellent base camp for the network of trails that serve Kootenay National Park. Located at the north end of Kootenay National Park, Marble Canyon in located close to many mountain park attractions. From Marble Canyon, visitors are only a short drive from spectacular hiking trails in Kootenay including the Burgess Shale Fossils guided hike to Stanley Glacier, Floe Lake and Ball Pass. Marble Canyon Campground’s close proximity to Banff and Yoho national parks makes day hikes on the Iceline, Taylor Lake, Bourgeau Lake and Twin Lakes trails a breeze. Marble Canyon Campground has 61 un-serviced camp sites. First-come, first-serve. Marble Canyon Campground is open June through September. It’s central location within the park makes it a perfect location for groups wanting some quiet space and still have access to what the park has to offer. Small RVs are allowed, but note that this site is not serviced. Redstreak Campground is a 242-site campground providing a variety of amenities including full hook up, semi and non-serviced sites as well as ten oTENTik tent cabins that can be rented on a nightly basis. 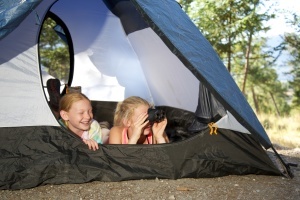 Located in the southern most portion of Kootenay National Park, overlooking the Village of Radium Hot Springs, Redstreak Campground has a magnificent view of the Columbia Valley and Purcell Mountains.